Few would begrudge Def Leppard performing their 1987 album Hysteria in full. After all, it is their best-selling record (25 million copies worldwide), with seven hit singles culled from the 12 tracks on the album. The first half hour of their Arena Birmingham show felt like a greatest hits event as the band chose to play the songs in the order they appear on the record – and six of those seven singles just happen to be the opening tracks on the album! So it was a breathless beginning as 59-year-old frontman Joe Elliott stormed through the likes of Rocket, Pour Some Sugar on Me and Armageddon It. Impressive lights and lasers and spectacular visuals projected on a big screen at the back of the stage complemented the music, although at times it was difficult to know what to watch – the archive concert footage (including a moving tribute to the band's late guitarist Steve Clark), newsreel clips or the band on stage. Select the band and there was then the choice of watching Elliott strutting on the walkway into the audience, guitarists Phil Collen and Vivian Campbell searching for the spotlight as they swapped solos, bassist Rick Savage who seemed to dance around every inch of the huge stage, or powerhouse drummer Rick Allen, the musical miracle who has never let the fact that he has only one arm stop him from being one of the world's top sticksmen. Leppard pride themselves in their 'no filler' policy so the non-single songs still sounded great, even if the fan excitement levels dropped slightly after the initial burst of energy for the opening numbers. The likes of Gods of War, Run Riot and Love and Affection appeared as fresh and relevant as they did back in '87. 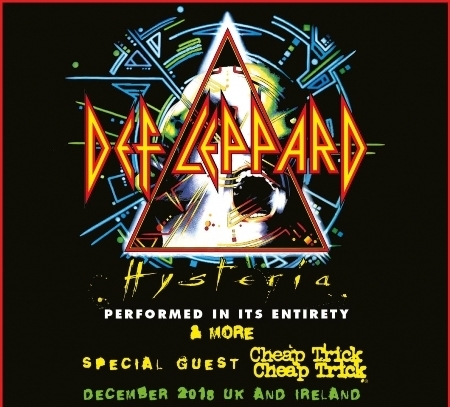 This Hysteria run-through was first seen in 2013 when Leppard had an 11-show residency at the Hard Rock Cafe Hotel and Casino in Las Vegas. It's been a long time coming to the UK but it was worth the wait. 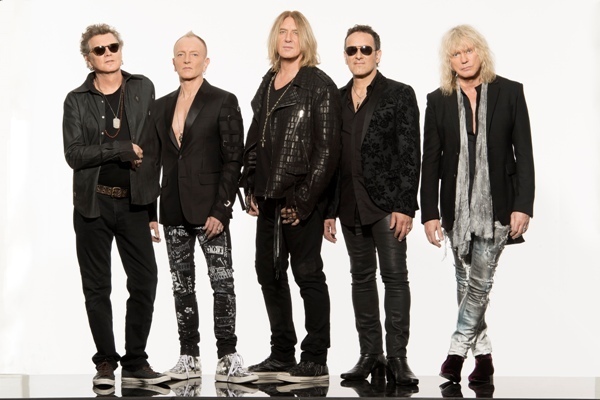 The Birmingham show was near the end of the tour and Leppard, who will be inducted to the Rock & Roll Hall of Fame in 2019, ran like a well-oiled machine. Elliott still found time to share some personal memories with the crowd, like playing Birmingham Town Hall in 1980. With the Hysteria album successfully performed some more big guns were wheeled out for the encore. The Sweet's Action was thrilling, the power ballad When Love and Hate Collide was the cue for torches to be waved by the fans, Let's Get Rocked and Rock of Ages got things rocking (obviously!) again, before Photograph sent everyone away happy and looking forward to Def Leppard's headline appearance at Download on June 14, 2019. Earlier, the show's support act, Cheap Trick, lined up a festive treat by inviting Birmingham music legend Roy Wood to join them on stage as they warmed up the crowd for Def Leppard. The former Move, ELO and Wizzard multi-instrumentalist led Cheap Trick through California Man and I Wish It Could Be Christmas Every Day – what more could we want at this time of year? Such a great gig. Spot on, Andy. Felt like I was reliving it while reading your review.